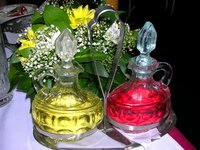 Colored cooking oil adds a decorative touch to dishes or craft projects such as Easter eggs. Use any colorless oil such as canola, vegetable, safflower or almond oil as your base. Dying the oil is simply a matter of choosing the color and mixing it in. You must use an oil-based food dye as opposed to the usual water-based color. Water-based dye will separate and bead in the oil. Oil-based dyes are typically used for dying chocolates, and they mix thoroughly into any fat-based product. Pour the oil into the bowl and microwave on medium heat for 30 seconds. The dye will mix into the oil more easily if the oil is heated. Remove the oil from the microwave and drop one drop of dye into it. Start with a very small amount of dye and add more if needed. Stir the dye into the oil. Mix thoroughly to dissolve the color. Oil-based dye will mix into the oil without separation. Add more color, if desired, then stir. Avoid dying oils too dark. The color may impart a bitter aftertaste and dye your mouth if used in excess. Try infusing oils with herbs to naturally create a green color or use chili peppers to create a red color. Simply drop a few sprigs or pieces of the herb into the oil, seal and allow to steep for one week. Preserving the flavor of fresh lemon balm gives you the opportunity to enjoy it for months after the fresh leaves have withered.